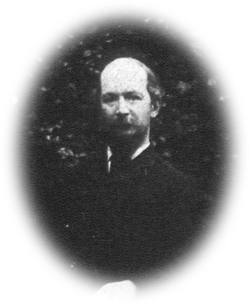 Algernon Swinburne, regarded as one of the better poets of his time, visited Poppyland as a result of of the interest in the area created by the writings of Clement Scott. By the time of his visit or visits, Swinburne was being looked after by his friend Theodore Watts-Dunton. The following selection of verses have references which can be linked to Cromer in particular and the area in general. Hovering the cursor over the words in bold text will give you some of these references. Round and compassed in with clouds that flash and flee. Where the small town smiles, a warm still sea-side nest. Winds the sandy strait of road where flowers run free. Sad with fear or glad with comfort of the sea? When the soul bows down dethroned and dispossest? Bloomed broad above him, flowering where he came. Our father Chaucer, here we praise thy name. That sang for song's love more than lust of fame. Sceptral stems bore stars whose reign endures, not flowers that fall. Like the whole world's heart, with warm new life and gladdening flame. Fair befall the fair green close that lies below the mill! Lightlier breathes the long low note of change's gentler call. Peace, whose perfect seal is set for signet here on all. Here  the  full clove pinks and wallflowers crown the love they claim. Soft as roses answering roses, or a dove's recall. How their wrath may work on hoar church tower and boundary wall. Or the years that wing their way through darkness toward their aim. More than song, were song more sweet than all but love, might frame. Half the sliding cliffs are mire and slime. Dense as gouts from eaves grown foul with grime. Seasons clothed in sunshine, rain, or rime. Towers in sight here present and sublime. We, before the night upon his grave be sealed. High before us heaves the steep rough silent field. Wind is lord and change is sovereign of the strand. Star by star on unsunned waters twiring down. Golden spear-points glance against a silver shield. Soft as sleep, the waking wind awakes the weald. Wielded as the night's will and the wind's may wield. Soon, where late we stood, shall no man ever stand. Yet, for all his weakness, shall not hope abide? We should know what never man hath known, nor eye of man hath scanned. Breaks or stays the strength of waters till they pass our bounds of dream. These whereby we stand no shore beyond us limits: these are free. Flash and fade the wheeling wings on wings of mews that plunge and scream. More  than  motes that thronged and trembled in the brief  noon's  breath  and beam. Passed, and left us, and we know not what they were, nor what were we. Would we read of sleep's dark scripture, pledge of peace or doom or dole. Friend, who knows if death indeed have life or life have death for goal? What has been from everlasting, or if aught shall alway be. Nor cloud for him seem living sea or land. Beneath the coil of dull dense waves and hours?